How far will a man go to survive? Andrew Waters, son of an American diplomat and a Chinese mother, already has two strikes against him when he joins the crew of the USS Pilgrim not long after Pearl Harbor–his mixed heritage and his pacifism. He never expects he will fall in love with his handsome commanding officer. The crew of the Pilgrim is captured and sent to the notorious Changi POW camp. The man Andrew loves will die without proper medical treatment. To save his life, Andrew makes a choice that could destroy not just his future but his life. 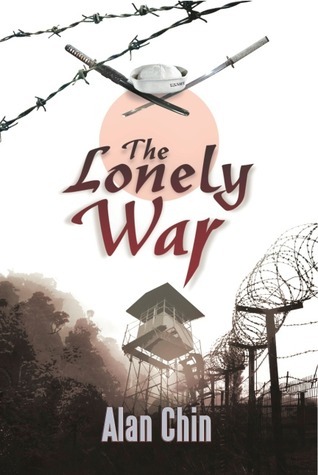 I thought The Lonely War was a complicated, interesting, gripping examination of humanity in the face of war. The MC, Andrew, is half Chinese, half American. The book is set during an especially volatile time in history for someone of mixed descent—the 1940s/WWII. Andrew is extraordinarily smart, and aware of his attraction to men. He’s taken to America and forced to be part of a war he doesn’t believe in. With those factors combined, Andrew knows he doesn’t—can’t—fit in, not ever, and pretty much the entire book, he’s forced to prove his value and worth in one form or another because of his heritage and sexuality. It really was tragic on levels I can’t even address in a review. Nathan Mitchell, Andrew’s commanding officer, is a fair man in ways that were sort of unexpected for a military man of his time. I liked Nathan and his approach (for the first part of the book, anyway). Things really begin to unfold when Andrew and Nathan are captured and sent to a Japanese POW camp, where Andrew is forced to take on some fairly extreme measures to protect himself and Mitchell, namely making himself a “servant” to the leader of their prison camp. There’s tenderness there, though, and that was confusing for me! I was really affected over the portion of the book that details the end of the war. It was almost another story, to be honest. Andrew and Mitchell’s situation changes (for the better?). The men resume their lives, and though there is some feeling between Mitchell and Andrew, they go their separate ways. Andrew was especially adrift, and reading about his life after that period was just so depressing; Nathan moved on, and there’s a feeling of real loneliness to the story. From there, things just got rather weird, I thought. I was sad for the direction Andrew and Mitchell each took. I wanted both of their lives to be richer. But at the same time, I understood why things went the way they did. This book is, after all, set in the 1940s. I enjoyed the writing style of this novel, much more so than the other book I recently read by Chin (First Exposure). Make no mistake though: there is absolutely no romance in this book. I guess you could say there was mutual feeling, possibly understanding, maybe respect. But not love, and that was hard for me, because I love the falling-in-love aspect of epic, tragic stories like this. As I guess is typical of Chin’s writing style, there was a definitive feeling of “real life.” Turns out real life isn’t entirely fair, though. Prepare yourself, this one is long, but it’s worth your time if you’re okay with not-so-happily-ever-after. This entry was posted on October 7, 2014 by Jenni in Historical, Reviewer: Jenni and tagged 3 Stars, Alan Chin, War is Hell, Zumaya Publications.